For me Christmas isn't Christmas without a new fragrance under the tree. There is just something about opening up a new bottle of perfume and that first spritz on Christmas Day that conjures up nice memories and seals it as my Winter scent for the new year. 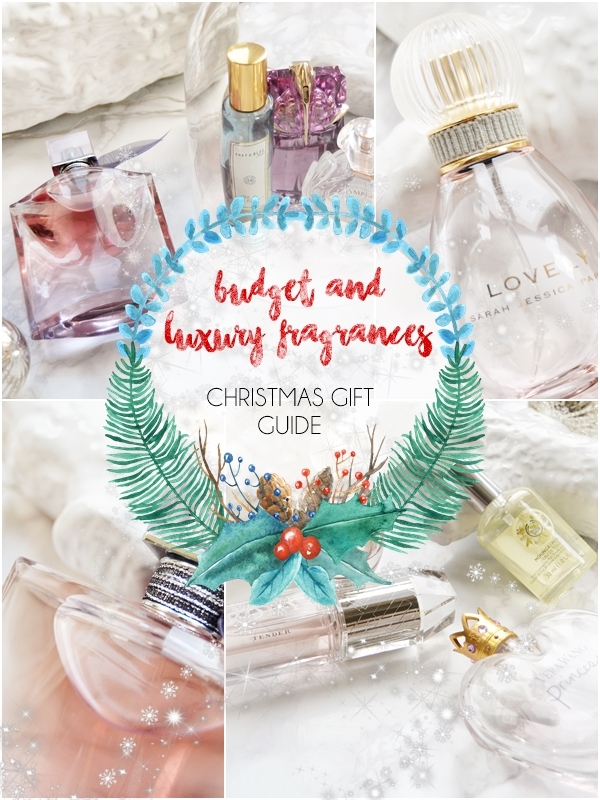 As everyone is on a different budget I thought I'd share with you four budget friendly fragrances and four much more luxury scents that will hopefully suit someone you are buying for this Christmas. Or this may simply give you a few ideas for what to put on your Christmas list! 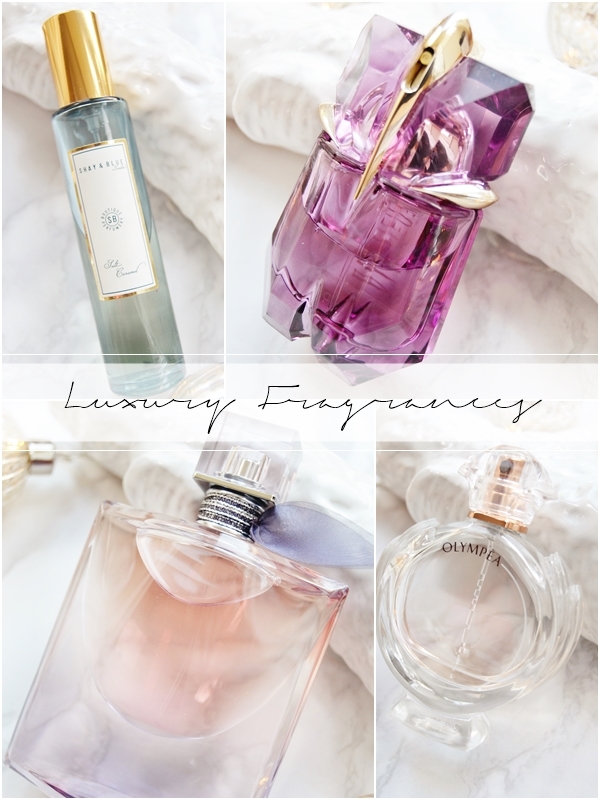 A light powdery scent that is perfect for lovers of ultra feminine fragrances and any age I've found. This has been a true favourite of mine for many years and really doesn't smell like a cheap scent. I also find the bottle really elegant. A good all round fragrance if you were unsure of what the recipient would like. Over the past year or so Vera Wang Princess, a fragrance loved by many, has dramatically come down in price! 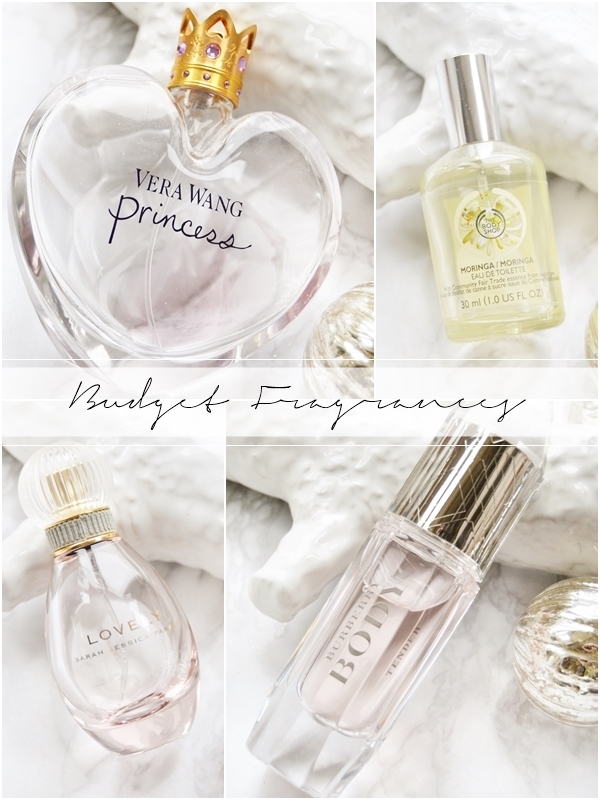 This is generally when a fragrance has been discontinued but this isn't the case for Vera Wang Princess and I think is more to shine the spotlight on their newer fragrances. But that is good news for anyone that loves the scent like I do. This again is a feminine scent that is very floral and vanilla-y and just pretty, yes, I'd describe it as pretty. Ideal for a teen or anyone in their 20's that likes feminine sweet floral scents. This is a scent I mentioned only yesterday in my Under £15 Christmas Gift Guide but a scent I've had in the past when it was much pricey than a mere £13! Body Tender is a softer silkier version of Burberry Body meaning it's a scent that most will enjoy. Expect notes of rose, sparkling peach and a hint of musk, though all round it's quite a clean fresh scent. For the price this is amazing value for money and as you can see comes in a luxurious bottle and packaging. For years I've been in love with The Body Shop perfumes as they are inexpensive and come in a range of different scents, from Honeymania, Shea, Coconut, Moringa and many more. Above is my favourite spring/summer scent, Moringa which is such a lovely floral fragrance but there are just so many amazing scents to test out in-store. Plus with The Body Shop's 40% off sale at the moment a perfume plus a few other treats would make a great budget gift. Shay & Blue was the luxury fragrance brand that stood out to me this year with some amazing and unique scents. Here I have the rich and gourmand Salt Caramel scent that has been a true favourite of mine for the past few months. This is a truly yummy scent that smells to me more of popcorn than caramel and is certainly a scent for someone with a sweet tooth. However Shay & Blue Blood Orange is another amazing scent from the brand. Though a luxury brand £30 is a great price for these scents and they come beautifully packaged. I've loved many scents from Thierry Mugler over the years but Alien has become a true signature scent for me and one I often get compliments on (along with Guerlian Insolence). This is certainly an attention grabbing perfume that is perfect for someone that enjoys a bold scent. The main notes of this are jasmine and amber, creating a unique yet sensual fragrance with great staying power. A perfect Christmas gift, especially if you go for a luxurious gift set! Lancome know how do luxury especially when it comes to fragrances and their recent Eau De Parfum Intense of La Vie Est Belle certainly shows that with an amazing silage of around 10-12 hours. If you are new to La Vie Est Belle I'd describe it as a sweet yet smooth mature scent that definitely smells luxurious, but the notes of this really do fail me as it's so well blending, though I can smell Tuberose and a slightly nutty warmness to it. This is such a lovely unique scent that really has to be smelt first and marvelled at how long it lingers for. As for the bottle... just wow! Hope this has helped to give you a few ideas! P.S If you are planning on picking up a special someone a fragrance this Christmas then my favourite savvy of mine is to be to take a small bag of coffee beans with you when out shopping - it cleanses your nose of previous scents so you can smell as many fragrances as you wish so you don't get nose blind!